Quite simply, the site allows you to map connections between various corporations, using members of their boards as nodes, or relay points. It’s Six Degrees of Separation for multinational corporations. One popular map, for example, documents the connections between Halliburton and major media outlets. Aylwin B. Lewis, we find, is on Halliburton’s board of directors and Disney’s board too. Meanwhile William R. Howell sits on the boards of Halliburton and Pfizer. On Pfizer’s board is William H. Gray, III, who in turn is also on Viacom’s board. There is a direct line, then, from a war-profiteering energy conglomerate to the owner of MTV and CBS news. They Rule makes no claim that there is a grand cabal among Halliburton directors, controlling the mass media. There is no conspiracy here. Nonetheless, it is unsettling to see so much corporate power concentrated in the hands of so few individuals. It seems that above the daily lives of most Americans there is a free-floating network of corporate entities and wealthy individuals to which we have no access. They, in turn, have little accountability to us. Their chief loyalties are to each other. The best part of They Rule is that you or I can create and save our own database visualizations for others to see. That is, we can archive these connections, print the maps, or email them to others. Some of these user-created maps can be truly informative, like the maps I refer to above. Others can be misleading, such Time Warner Has Their Hands in Everything. This map shows how members of Time Warner’s board also sit on the boards of companies like Dell, Chevron, or FedEx. This much is true, of course. What is misleading is the map’s title. Time Warner the company doesn’t have its hands in everything. Its people do. It’s essential to remember that behind every faceless corporate entity there are people. This is at once discouraging and liberating. Discouraging, because you begin to realize that there exists a class of people who seem untouchable, a world unto themselves, making decisions based on bottom lines rather than less tangible motivations, like dignity and sustainability. Liberating, because you begin to realize that power, whenever it is held by mortals, is fluid and transformable. There is space for resistance whenever humans are involved. They Rule is one front of this resistance. The recently proposed merger between JP Morgan Chase and Bank One has got me thinking about the ways that multinational corporations work. Never forget that these two “banks” are really corporations — meaning that their primary concern is, always, to make more money. And, ironically, to make more money at any cost. The cost, unfortunately, is almost always measured in human lives. Who can forget the 1995 Chase Manhattan memo recommending that the Mexican government “eliminate the Zapatistas” rebels in Chiapas in order to secure foreign investments? Who can forget? Apparently most everyone. So in addition to Britney Spears albums, this network of companies produces bombs, missiles, and fighter jets. These corporations form a node that GYBE! 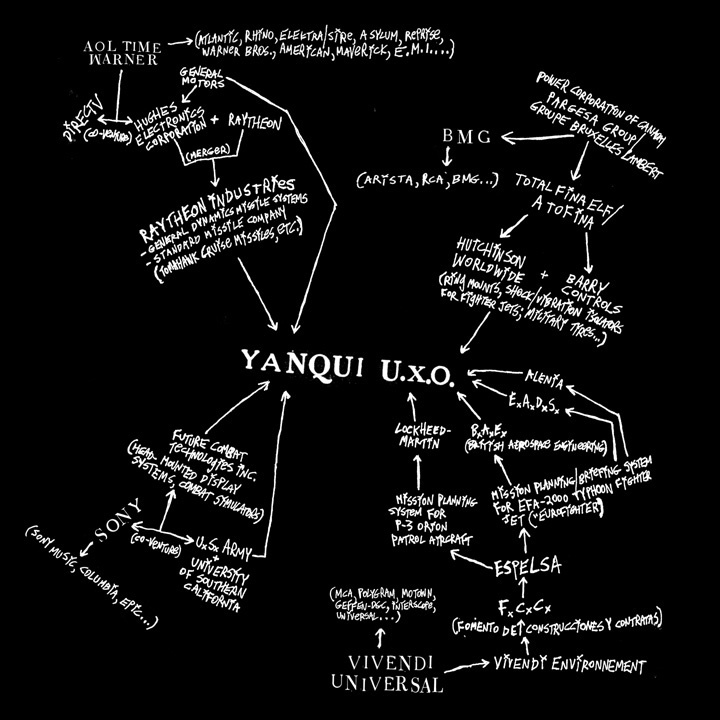 calls “Yanqui U.X.O.” — a phrase which is not so difficult to understand once you know the language. UXO is a military term which means “unexploded ordnance.” In other words — a bomb waiting to go off. And Yanqui is Yankee, seen (and spelled) from the colonized’s point of view. These corporations deal in real violence, but there is also a kind of metaphysical violence going on in the way that their interconnectivity and culpability is obscured. Britney’s smash CD comes out on a Jive Records label. Jive Records is owned by BMG. BMG in turn is connected to the Franco-Belgian oil giant TotalFinaElf. And TotalFinaElf owns Hutchinson Worldwide, a company that makes, through its subsidiary Barry Controls, essential avionic and missile components for the defense industry.